We were recently given the opportunity to review some music from Happy Kids Songs. Dr. Mac, who wrote the songs, is also the music director and songwriter for the PBS show, Jay Jay the Jet Plane. I've watched many an episode of that program with my son. 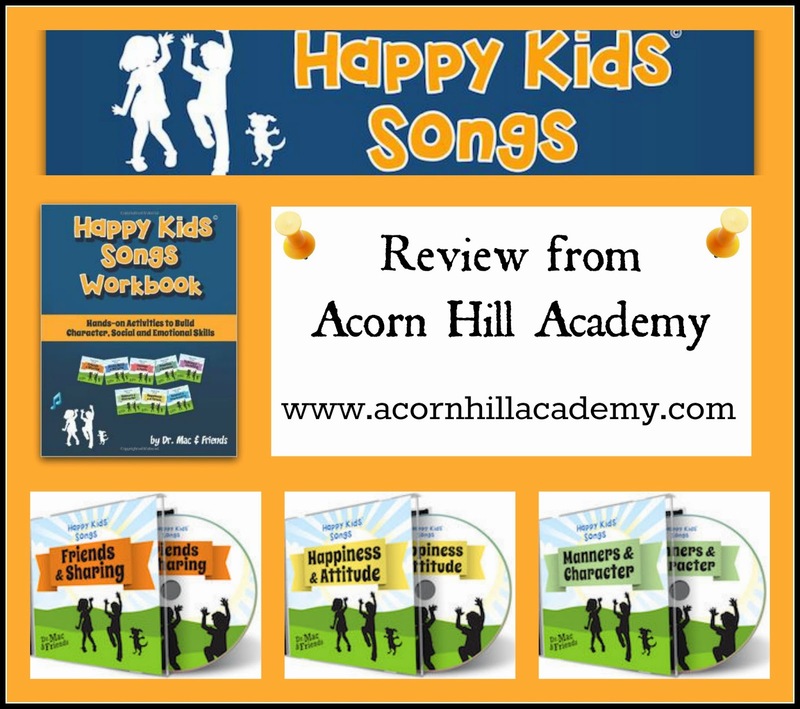 We received three albums, a total of 15 songs, along with the Happy Kid Songs Workbook. The songs and workbook are intended for children ages 3-8 years. The Magic Word - Using "magic" words, like "please"
The workbook includes lyrics for all the songs on all 8 albums available from Happy Kids Songs, and an activity page for each one. Sometimes there is a coloring page, sometimes a puzzle like a word search, etc. In the back of the book, there is a section for each song, which tells the focus of the song, social and emotional concepts, and then presents some coordinating activities. I had some kind of an issue downloading the songs, but I'm not sure what it was. I had my husband take a look at it for me, and he assured me it was user error. He was able to get them downloaded just fine, and I put them on my phone for easy listening in the car. These songs would be a nice addition to character education materials, and would work well in a preschool setting. Although the songs are presented from a secular viewpoint, you could incorporate them into Bible and character materials. The workbook would be a nice resource for a classroom setting, as well, although it was a bit of overkill for us. You can purchase any of these products through Happy Kids Songs. Each 5-song album is $4.95, and individual songs are available for 99¢. The workbook is $13.95 list price, and is available for purchase through Amazon ($12.56 at the time of this review). You can hear samples of each song on their website. Also, once you've purchased an album, you can download the lyrics, coloring activity sheets for the songs once you've purchased them. That would be a great way to try them out to see if you'd like the complete workbook. The workbook does allow copies to be made for home or classroom use (one classroom, not an entire school). Connect with Happy Kids Songs on Facebook, Twitter and YouTube!